2016-06-25 - Updated shell sound emitter. Shell sounds should now definitely survive save and reload. 2014-03-15 - Compatible with game version 1.67. No changes. [infobutton=older updates]2012-06-10 - Ensured compatibility with game version 1.34. 2012-03-12 - Screwed up AutoRailingsDisabler and AutoRoofDisabler. Please redownload if you downloaded in the past hour. 2012-02-12 - Added Auto Railing Disabler. 2011-07-30 - Whoops, forgot to turn off the debugging switch before releasing the short cheats mod. Fixed. Build/Buy Restriction Choker - Ripped out cheat stuff. Redownload or it will probably clash with the Short Cheats mod! Supported for game version 1.67. Should work with game versions from 1.31 upwards, though. This mod disables the Autorailing setting on stairs and make sure it stays off. Autorails will stay disabled all the time. You cannot switch them back on even if you want to. This will cause the rails that are by default applied to the cement stairs to be unavailable. EA missed to make them show up in the buymode catalog. Fortunately, armiel made an override that unlocks them as well as some new rails. If you're a builder, you probably know all her downloads anyway. Under certain circumstances (see known issues of Build/Buy Restriction choker), the code may fail to become active when entering build/buy mode. This mod adds abbreviated versions of existing cheats to the game. Use them just the same as you use the original cheats, i.e. "tse true" instead of "testingcheatsenabled true". They will not turn up when you use the 'help' command in the cheat console! BTW: This mod is targeted at builders, but it supports all kinds of cheats. If you want to specify it to your liking, see the tuning package section below. If you add the tuning package to the game, some cheats that seem useful for builders, will be activated by default. You can also alter the tuning package to modify the abbreviations and supported cheats as well as the cheats that shall be call on startup. If you can do even a little bit of XML modding, this should be very simple for you. This resource contains the supported cheats and their abbreviations. This resource contains the cheats that are called on startup. If you have trouble following these instruction, refer to Tutorial:Sims_3_XML_Tuning_Moddingwiki and instead of loading Sims3GameplayData.package, load the tuning package. No support will be given for these instructions beyond the actual data format of the XML files! I will not teach you tuning modding here! Select a resource and look at the preview. If you want to edit a resource, right-click on it and click on Notepad. Make your changes in Notepad. If you want to add a new abbreviation, copy that block and add it to the file between the last tag and the tag. Enter the abbreviation between the NewCommand tags. Enter the original cheat between the OldCommand tags. If you want to remove a cheat, simply remove the whole related block beginning with and ending with . If you want to add a cheat, copy the block and add it to the file between the last tag and the tag. Enter the cheat that you want executed between the Command tags just like you would write it in the cheat console. Do not use the abbreviations in this file, but the original cheats! Save the file in Notepad and close Notepad. Back in S3PE, commit the changes and save the package. Ever noticed how you can't set a door to be an NPC door, unless both of its sides are inside a room or at least fenced in (which is the same actually)? Well, that's a bug. This mod fixes it. You can now set doors to be NPC doors even if they're directly facing the great outdoors. This mod, that is actually a scripted object, can emit the sound effects from shells aka high rises. 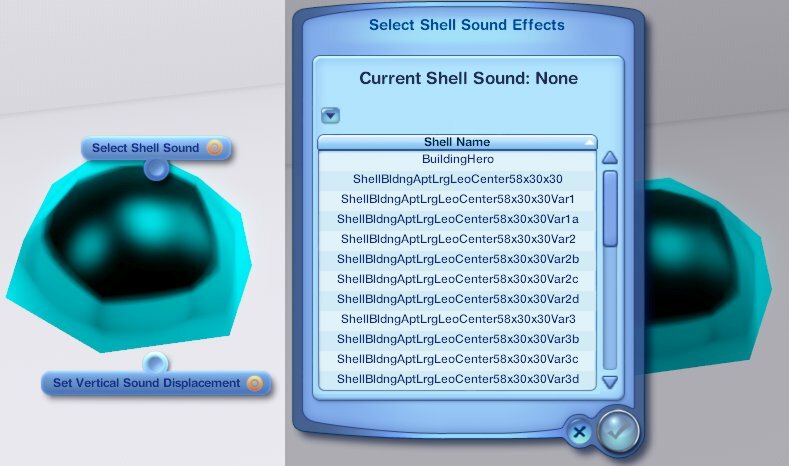 Buy it in the BuyDebug category and then select the shell it shall copy the sound effects from and in which height the sound shall play. Remember: Hold Shift and Ctrl and then left-click on the object in build/buy mode to use build/buy interactions. Hint: Shell sound consists of three different sound effects. Two are ambience sounds for top and bottom and the third can be specific for each shell. Additionally, there are different sounds for day and night. The top ambience sound plays at level1 height of the position of the emitter object. Whatever that means, it's the same as the original object. The bottom sound plays at the height of the emitter object. The shell-specific sound plays at ground level plus the vertical sound displacement you set. I'm interested in feedback on that, especially if the height of the top ambience sound makes sense. If not, I can give it its own height. Since this mod parses the whole GameplayObjects assembly for BuildableShell objects on startup, it may delay the load by a couple seconds. Was a non-issue during testing, though. Sorry, but the menu only shows the arbitrary class names of the shells. Showing thumbnails is difficult in this particular case. This mod disables Autoroof by default and make sure it stays off. Autoroof will stay disabled all the time. You cannot switch it back on even if you want to. However, you can click on the enable ticky button and it will act as a one-shot autoroof ... thingy. It will be disabled again immediately afterwards. This behavior is intentional. This mod makes community objects available on residential lots and vice versa. Under certain circumstances, e.g. when you enter Edit Town from build/buy mode and then enter another lot in build/buy mode, the restrictions may still be active. Just changing from build mode to buy mode and back or vice versa will usually do the trick then. If not, you need to exit and re-enter build/buy mode. I didn't investigate this further, because there's nothing I can do about it anyway. This is a scripting mod and as such the possibility for conflicts with other mods, no matter what kind, is next to non-existant. Just rip it out whenever you like.